This entry was posted on January 2, 2010 at 9:38 pm and is filed under Uncategorized. You can follow any responses to this entry through the RSS 2.0 feed. You can leave a response, or trackback from your own site. I have a watercolor picture of the row houses where Mr Parkman lived and on a little plaque reads: “here lived & died George Francis Parkman 1823-1908” This is a very large beautiful picture by an artist named Shectman 1980….. Fantastic. Fine old brown stone. His house and gift to the City of Boston are maintaining the Boston Common etc. 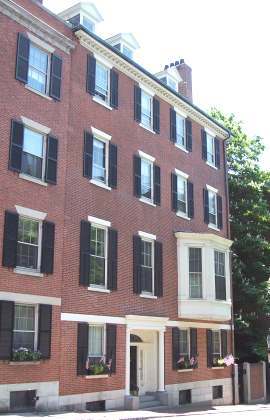 See http://www.ParkmanGenealogy.wordpress.com for other New England family history. would the above mentioned picture be of any interest to the city of Boston or Parkman Genealogy? I can send a picture of it. More likely that The Parkman House = Mayor’s Official Reception Hall would have an interest in your watercolor picture. Antiques Roadshow painting by Aldro Hibbard was painted of a town called South Londonderry Vermont. The Church on The Hill is no more. I am afarid that landmark burnt two years ago. Some of the buildings in the painting still are there. One being what we call the annex building. (was my Great Great Grandfathers Blacksmith shop) (left of the covered bridge.) This is an awesome find. My grandfather, William P. Long, was park commissioner or Boston for many years. His office was in this beautiful site where he could overlook the the Common. I am curious to know if you ever rent out the apartment. I have just found out that I have pancreatic cancer and will need a place to stay while I get my radiation treatments at MGH every day for 6 weeks. The estimated dates of this treatment is expected to occur sometime in January, 2018-February, 2018. I’m wondering if this is something you would consider. What a wonderful place for my large family to visit! You would need to confirm the Mayor’s office atb the City of Boston. Thank you very much for your quick response. I will have someone in my family contact the Mayor’s office. I remember quite a while back will I was caretaker for my brave nephew who was suffering from Cystic Fibrosis at MGH I took a walk up Charles St. and turned left on Beacon. I walked up to 33 and just stood there. I remembered visiting my grandfather there while he was at work. I was compelled to knock on the door not knowing if it was a private residence or something else. A very nice lady answered the door and I told her that my grandfather use to have his office there. She asked me who my grandfather was and when I told her she welcomed me in and brought me into my grandfather ‘s office. She knew of him right away. Then she gave me a tour of the Parkman home and also told me that the city of Boston now owned it and what it was used for now. It was a day I’ll never forget! All newspaper accounts of Francis Parkman’s death state he died at his home on Prince street in Jamaica Pond, Boston MA so, I’m confused by the plaque stating he lived and died at 33 Beacon street. Francis @ Jamaica Pond & George @ Beacon St…. My former wife Connie Anderson McNally was the first director of the Parkman House in the late 1970’s.She along with Designer Janice Miller over saw the dramatic renovation of this old cherished mansion into the official reception center for the city of Boston. Both have unfortunately passed but if you have any fond memories please forward them to my email cjopdm@aol.com. Thank you Paul D. McNally, Esq.